It’s a captivating book—highly technical, but engaging enough that you aren’t (usually) tempted to skim. I have, perhaps, a higher than usual tolerance for the nerdy technicalities of space travel, but Weir has created a charming hero and let most of the story play out through his voice, so I think most people will stay hooked even through the longest stretches of scientific exposition. What the story lacked, for me, was emotional weight. Watney is pretty calm and collected throughout his sojourn on the Red Planet. Astronauts are selected as much for their emotional strength as much as their scientific knowledge and physical prowess, and they’re trained for this kind of stress. But even the most well-adjusted man of science has to come away from this kind of experience with some kind of revelation or insight and I’m not sure Weir’s hero did. The closest we get to moment of philosophical clarity is a brief monologue on the instinct all humans have to retrieve a lost soul (it’s in the trailer too), but I wanted more—a glimpse of how someone [SPOILER ALERT] returns to life on earth after more than a year stranded alone on another planet, how the experience colors our image of our species as intrepid explorers, and how the world’s attention waxes and wanes throughout the process. I’m interested to see how the movie adds–or doesn’t add–that emotional depth, but in the trailer it appears they decided to give Mark a wife and kid, which is the laziest way to go about it, so I’m preparing to be unimpressed. One of the things I liked about the book is that it avoided giving the hero the typical accoutrements of a Man Worth Saving—the dependent wife, children who will be too young to remember Dad if he dies now, a family dog. That a single man with only elderly parents to mourn him was worth a multi-billion dollar worldwide rescue effort is just a little bit revolutionary in a popular culture that generally views a single person as more expendable—but that’s a rant for another time. The science seemed pretty sound—improbable at times, but not impossible—but I got, like, a C in high school chemistry so…who knows? I’d love to know how much time Weir spent researching the science behind a hypothetic Mars mission and what his sources were, because it is a highly technical book. Andy Weir was a computer programmer before he became a writer, but his parents were a particle physicist and an electrical engineer, so maybe some of the science know-how runs in the family. It’s to Weir’s credit that I was rarely tempted to skim the more technical passages. That said, I can’t claim this is my favorite book about a voyage to Mars. 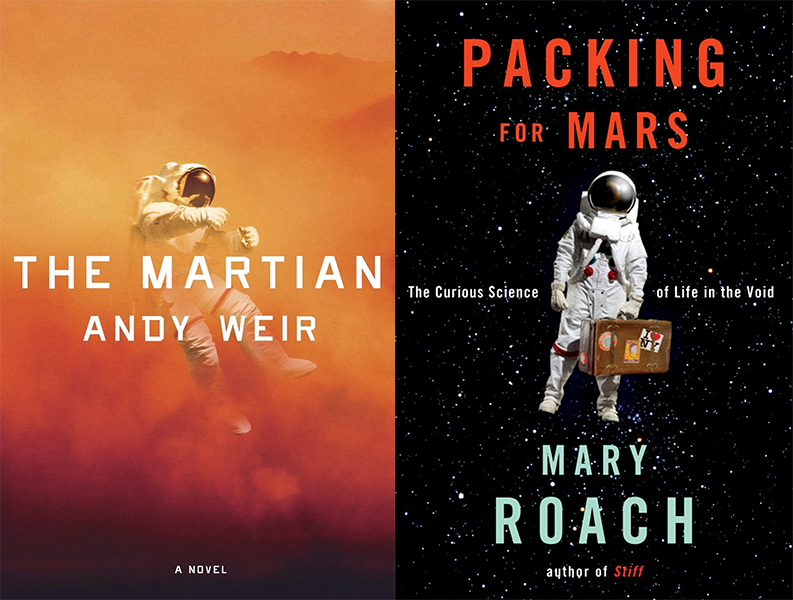 Packing for Mars by Mary Roach is a non-fiction exploration of the various preparations and experiments that space programs around the world have been going through in anticipation of a manned mission to Mars, and I couldn’t recommend it highly enough. Something she talks about several times is our inability to anticipate how the human mind will respond to space travel. Once upon a time, people thought that journeying into the vast, dark nothingness of space would literally drive astronauts insane, and early space flights were largely used to test the impact of the experience on the psyche. Major Mars simulations, like this one, are already underway. But the thing is, no matter how realistic your simulation, or the lengths you go to to cut your test subjects off from contact with the outside world, there are no conditions you can create on earth that can test how a person will respond to the knowledge that they are absolutely beyond rescue. Test subjects always know there’s a way out of the simulation. Even on the Space Station, astronauts are only ever a few hours from home. They have escape pods. There’s a shuttle on the ground ready and available for a rescue mission should anything happen. In The Martian, Watney’s options for rescue are few and far-fetched, but there are options. And in that way it seems Weir avoids answering in fiction the question that we can’t answer with fact, and that’s where I feel the novels fails, if only slightly. Throughout his time on the red planet, Watney remains focused on the the task at hand and despairs only at the lack of entertainment options. It seems a little hard to believe that he wouldn’t be more consumed by his total solitude, but given that astronauts have usually shown themselves to be far more resilient than anticipated in the face of space’s psychological effects, perhaps it’s not so unrealistic at all. Last fall, I went to a panel on commercial space travel at the New Yorker festival with Bas Lansdorp, CEO of Mars One, Adam Steltzner, an engineer at NASA’s Jet Propulsion Laboratory, Bill Stone, CEO of Stone Aerospace, and Wally Funk, who participated in the Women in Space program and was in contention for the Mercury 13 program. As part of the program, Wally underwent extensive and grueling tests intended to determine if women were fit to be astronauts—both physically and mentally. The tests included time in a sensory deprivation chamber designed to make participants hallucinate by floating them in water with absolutely no stimuli to simulate the nothingness of space. She set a record for spending the longest period of time in the chamber (10+ hours) without hallucinating and scored higher on her tests than John Glenn, but the final phase of testing was canceled and the women were never assigned to a NASA mission. Different types of isolation tests are conducted now in preparation for Mars, but these are more about testing emotional isolation over the long term, which is the real challenge of Mars, since the missions will necessarily be years long. Wally Funk never flew in space, but commercial space flight is now introducing that possibility for more people to take part in space exploration, whether part of a government space program or not. She was enthusiastic about her chances of finally making it to space now, and I hope she will. The difference between private plans for Mars colonization and the fictional NASA program of The Martian is that programs like Mars One are one-way trips. Bas spoke about how many people with families signed up—some of them with small children—knowing they would never see them again. And I’d like to have seen Whatney, family or no, confront that kind of permanence, to be stranded completely without hope of rescue. It would be a different story, but one we could use. The cost of Whatney’s rescue comes up a few times and it’s another area I wish was explored more. The world pulls together for his rescue—both fiscally and in sacrificing existing space missions—and keeps tabs on him via a daily news segment on his status once it’s know that he’s alive, and it would be interesting to see how this attention plays out over time. This entry was posted in Arts, Books. Bookmark the permalink. Good post! And I’m not just saying that because I’m going to see you this week for the first time in forever. I read both books as well (Roach’s a while back and The Martian last month) and I agree with pretty much everything you wrote. From a snob standpoint, I found The Martian compelling in its concept and all the science, which ramped up the tension again and again, but the writing style was basic at best – but it didn’t matter. I found Packing way better (one of my favorite books whatever year it came out, and maybe my favorite from Roach) in the way it explained all the ways man had to adapt and learn how to get off our own world. I’m fascinated by the “no man left behind” ethos that I was fully exposed to when I moved to the U.S. Not that Canadians leave all their dead, wounded and lost behind, but it’s a huge point of pride here (maybe I’m feeling more of the military side of things?) that even if you die, we’re coming back to get you, no matter what. The thinking is that if everyone knows that even if they fail, they’ll never be truly lost or alone, that they’ll push farther, try harder and do more. If people got lost in the woods and helicopters weren’t deployed because it cost too much, I wonder how that would impact dumb and ill-equipped people from wandering into the woods. Maybe a little? Probably none? I didn’t spot any. And realized that were I Whatney and could I somehow bribe and cajole my way onto a manned mission to Mars where I’m left behind with some Thanksgiving potatoes, I’m dead. Like, probably the first day. I agree with what you’re saying about the “no man left behind” theme. It’s a nice idea, but I’m not so sure it’s the most interesting angle from which to tell this story. And the writing was definitely basic. A lot of that could be blamed on the limitations of writing in the journal format, but he broke from that format repeatedly and didn’t make use of it explore other writing styles or to expound on deeper themes. It was mostly pretty matter-of-fact. As far as the science and math goes I was basically just nodding along like, “Yes, those numbers check out, makes sense, well done Mark,” as if I have a clue. I have serious doubts about that final maneuver with the Hermes though. Roach’s book is one of my all-time faves too. Also, remind me never to get lost in Canada.